No color represents summer as much as yellow (which also, depending on where you live, happens to make a fine display in autumn). Sunflowers, cold lemonade, fresh corn on the cob, and long, sunny days make yellow the star of the season. It’s a color that appeals to all our senses, with a canary serenading our sense of hearing with its song, a bag of buttery popcorn stimulating our sense of smell, a ripe lemon refreshing our taste buds, a fluffy chick delighting our sense of touch, and an available New York City taxi when it’s raining treating our sense of sight. With all that good cheer associated with it, when you happen upon it while you’re traveling, you’re bound to experience a little lift. These are my favorite occurrences of yellow. As soon as I entered Grand Teton National Park in Wyoming after a few days in Yellowstone National Park on a crisp September day, I was immediately greeted by the flittering yellow leaves of countless quaking aspen trees. Scattered throughout the park, particularly along the lakes and rivers, the quaking aspen puts on a fiery show every fall, and walking among these trees during a hike on a sunny day is akin to being bathed in a heavenly glow. Not only are the leaves that turn yellow every autumn a contrast to the tree itself, with its almost-white trunk with slashes of black, but they also flare against a cerulean sky when you look up, and against the green conifers that keep them company. 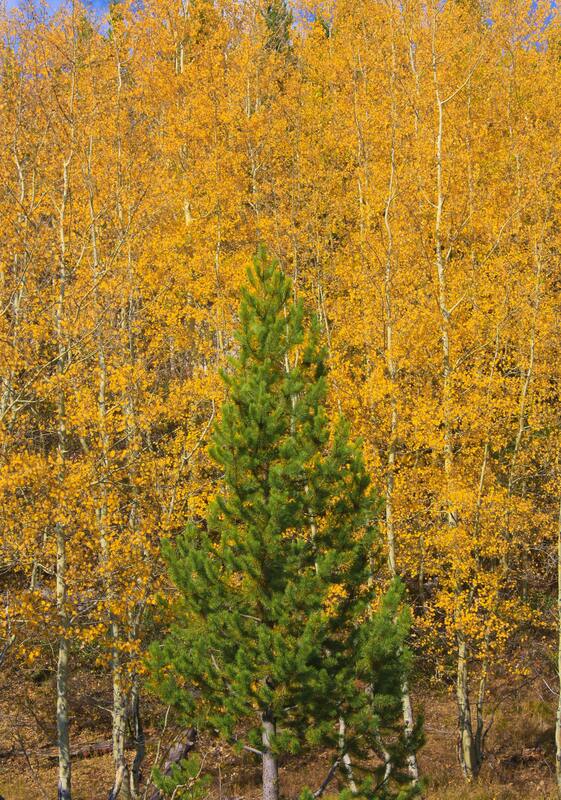 The widest-ranging tree in North America, the quaking aspen grows in groves from Canada through the United States and as far south as central Mexico. Although its time to shine every autumn is brief, it’s a truly glorious sight, and it’s a show that makes this gorgeous national park even more spectacular. 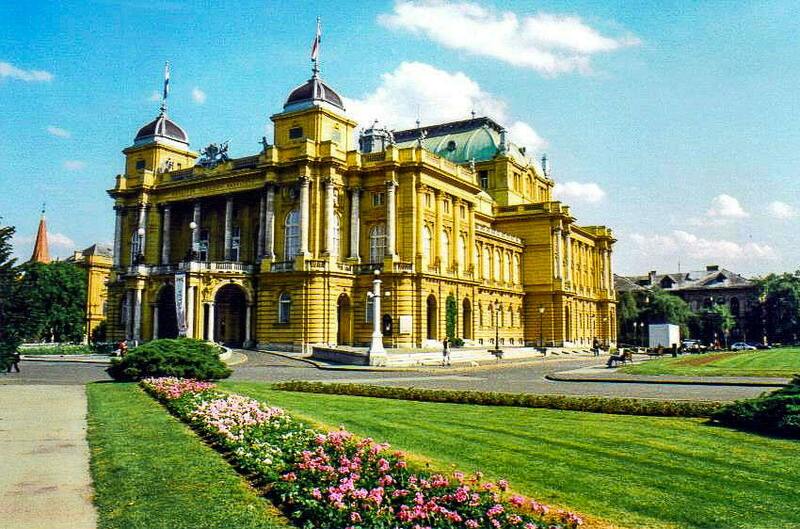 Surrounded by green grass and rows of pink and white flowers in the middle of Marshal Tito Square, the Croatian National Theatre in Zagreb is a neo-Baroque masterpiece. With the exception of the roof, some statues, and the columns, many of which contain the masks of comedy and tragedy in their capitals, the entire building is a bold yellow. After only a year and a half of a construction, Austrian Emperor Franz Joseph I officially opened the theater in 1895. At the front entrance, two short twin towers rise above the porte cochère, and busts of four poets and composers look down at arriving patrons. Since its opening, the theater has been devoted to drama, opera, and ballet, and has hosted the talents of such performers as Franz Liszt, Sarah Bernhardt, Sir Laurence Olivier, and José Carreras, who have played to a capacity audience of just over 700 who probably admired the building as much as the artists. I reaped the rewards of a drive east along the eerily deserted Route 44 from the ghost town of Scenic with a sneak peek at Badlands National Park in southwestern South Dakota. Anyone traveling on Interstate 90 to the north simply doesn’t have this view, and I was glad I had filled the gas tank so that I could appreciate this underutilized alternative to the park’s main entrances. The geologic formations of the park looked surreal, and even at a distance I could discern the treeless layers of sedimentary rock that rose abruptly from the grassy prairie, remnants of millennia of sediment deposits when the park was part of the ancient sea that stretched across the Great Plains. By the time I drove into the park at the Interior Entrance, I was primed for something remarkable. The Badlands Loop Road weaves its way around the buttes, spires, and pinnacles, but it wasn’t until I neared the end of the route that I found the Yellow Mounds. 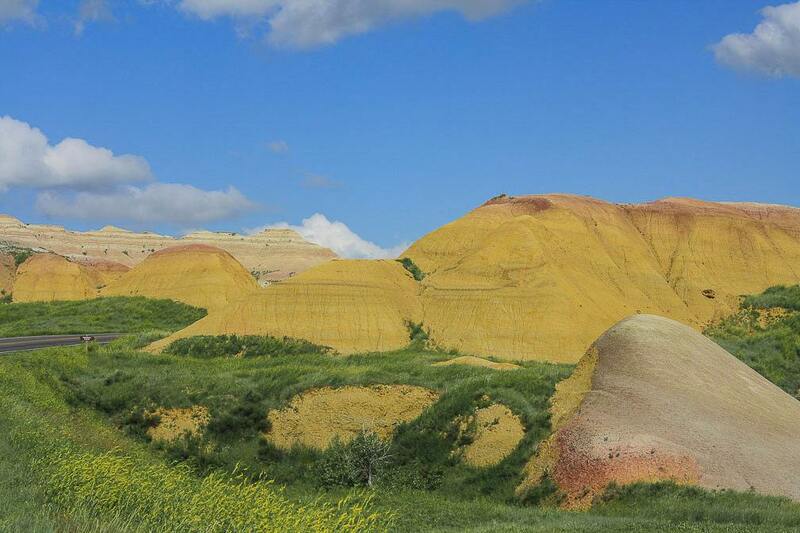 These giant yellow bumps, often topped with layers of rusty purple, formed when the upper levels of shale weathered into a fossil soil, or paleosol. Against the green grass and blue sky, they made the final few miles of, and my exit from, this national park unforgettably dramatic. The interior of the Theatine Church of St. Cajetan, locally referred to as just the Theatinerkirche, is an over-the-top display of Italian high-Baroque in white stucco. Outside, it’s all about the yellow. When Princess Henriette Adelaide of Savoy gave birth to a son in 1662, she and her husband, in gratitude for an heir, commissioned a church. Because she didn’t care for Bavarian architects, she turned to the Italians, who brought Roman influences and Mediterranean sensibilities with them. They completed enough of the church for it to be consecrated in 1675, but the dome didn’t appear until 1690 and the façade wasn’t completed until 1768. 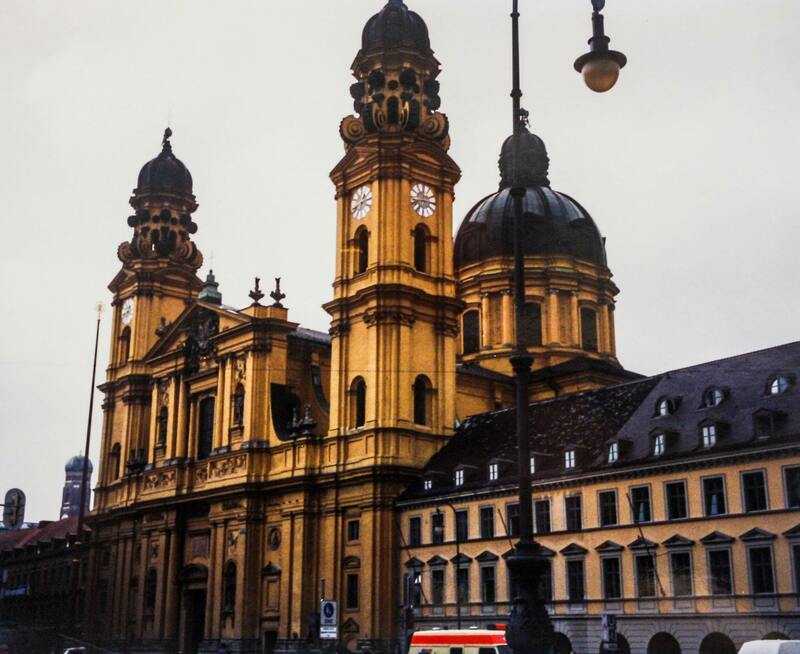 The church anchors a corner of the long, open Odeonsplatz, affording terrific views of its wide façade and twin 216-foot-tall towers, each topped by cupolas adorned with scrolls and each bearing two clocks, one on the front and one on the outward-facing side. The terrific yellow color is a striking contrast against its drabber neighbors, making the church one of Munich’s most recognizable landmarks. 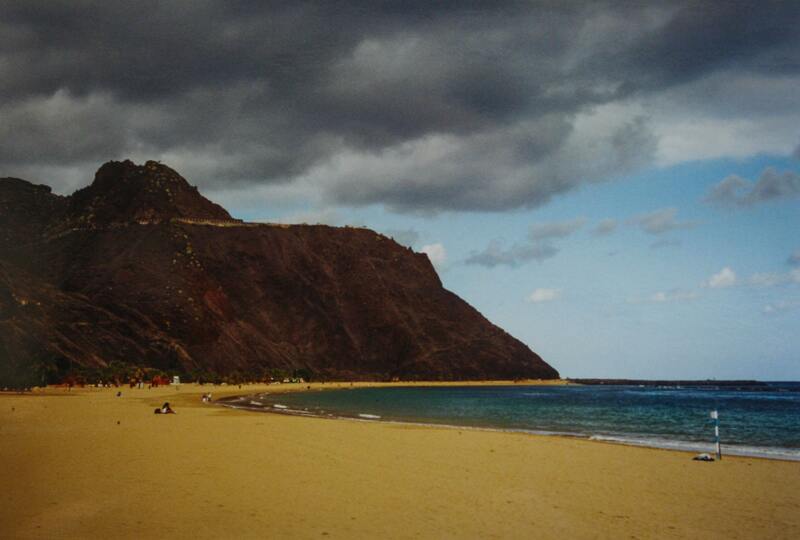 The black-sand beaches on Tenerife were interesting, but the golden yellow of Playa de las Teresitas easily surpassed them in terms of where I wanted to throw down my beach towel and enjoy a few hours of idle relaxation after driving around this ladle-shaped island for a while. Never mind that it’s totally artificial — in 1973, the island imported 270,000 tons of sand from the Sahara Desert to create the beach, and a breakwater more than half a mile long was added to ensure the protection of the sand from the waves that would carry it out to the Atlantic Ocean. With mountains and a few restaurants and snack shacks behind the beach and blue water before it, this yellow arc of paradise along the northeastern corner of Tenerife boasts the perfect color, size, and location to enjoy a day at the shore.